Prabhat Rao is an outstanding Hindustani Classical Vocalist of Britain, specialising in the Khayal style of singing. Based in London, he has had rigorous training under Guru Chandrima Misra of the Bharatiya Vidya Bhavan, UK. With his mellifluous voice and a strong understanding of the intricacies of rendering a heart warming Khayal, he represents the best of the talented young musicians in Britain, exemplifying the “Great British Gharana”, the evolving British school of musicians. In this album titled Khyal, Prabhat presents five compositions that represent the time cycle that Raagas in Hindustani Classical music follow. Bhairav is a morning Raaga and this traditional bandish “Prabhu Daata” evokes devotion to the Lord. In the afternoon Raaga, Multani, Prabhat explores the subtleties of the Patiala Gharana; the ‘drut’ bandish composed by Ustad Bade Ghulam Ali Khan is a key part of this Gharana’s repertoire. Prabhat concludes the album with Raaga Bhoopali for the evening which evokes Bhakti (devotion) and Shanti (peace). . imagination The world ‘Khayal’ originates from an Arabic world that translates to In this sub-genre of Hindustani Classical music, improvisation is the core of the recital where the artists are free to express themselves within the musical boundaries of Raaga (melody / mode) and Taala (rhythm). 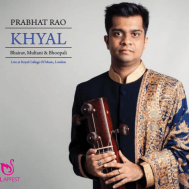 Milapfest is delighted and proud to produce and present this excellent debut album of Prabhat Rao, as part of its on-going work in supporting the development of young British musicians specialising in Indian classical music. Prabhat is both an engaging solo performer as well as a prominent member of the popular National Ensemble for Indian Music, Tarang, where he has worked with a diverse range of young British musicians to create a new cutting-edge contemporary classical repertoire. Milapfest looks forward to Prabhat’s future in Indian music with excitement and confidence; it is time, when a British musician takes the Global Indian music scene by storm!